"The cosmos is all that is, or ever was, or ever will be. Come with me." With those words in 1980 the astronomer Carl Sagan launched "Cosmos," an epic 13-part TV series that brought science to the public like never before, and opened up all of space and time to exploration. A generation later, Sagan's legacy lives again in "Cosmos: A Spacetime Odyssey," a 21st-century reboot premiering on Fox tonight (March 9). The new "Cosmos" (the original was billed as "A Personal Journey") updates its predecessor with a blend of spectacular visual effects and the latest astronomical discoveries. "He'd be thrilled that this new 'Cosmos' is going to be the largest rollout of a television series in planetary history," said series executive producer Ann Druyan, a co-writer on both Cosmos series and the widow of Carl Sagan, who died in 1996. "He would be absolutely thrilled and very proud that his flame is still burning so brightly." Druyan isn't exaggerating when she calls the new "Cosmos" premiere big. "Cosmos: A Spacetime Odyssey" will be broadcast simultaneously on 10 different U.S. Fox television networks, including Fox, the National Geographic Channel and Fox Sports, among others. Globally, it will be available on 220 channels in 181 countries in all. National Geographic will rebroadcast the show on Monday nights, and include extra snippets that offer a deeper glimpse into each episode. "Isn't that amazing," Druyan said. "I mean it's going to be on Fox Sports 2!" U.S. President Barack Obama will kick off the 21st-century reboot of "Cosmos" with a video introduction urging viewers to find their own way to explore the universe around them. The first episode was screened at the White House on Feb. 28. "In the video message, which leads into the debut episode, President Obama invites a new generation to embrace the spirit of discovery and inspires viewers to explore new frontiers and imagine limitless possibilities for the future," officials with Fox and National Geographic Channel said in a statement Saturday (March 8). In the week leading up to the premiere, "Cosmos: A Spacetime Odyssey" was screened in cities across the United States, where Druyan, Tyson and fellow executive producer Seth MacFarlane (of "Family Guy" fame) held live Q&A broadcasts for three different time zones. On Saturday, Tyson said that after a period of unpopularity in our culture, science seems to be gaining ground. While the new "Cosmos" makes the case for science for a new generation, some major elements from the original remain. Sagan's Spaceship of the Imagination, which he used to flit across time and space to tell the story of the universe is still there. So, too, is the Cosmic Calendar, which compresses the 13.8 billion-year history of the cosmos into a single year. Sagan's iconic "we are all star-stuff" moment? Check. "That's what we wanted to preserve, the idea that this is certainly educational and inspiring, but that it would have a certain P.T. Barnum element as well, which the original 'Cosmos' had in an immense way," MacFarlane said during East Coast Q&A event on Tuesday (March 4). "Particularly for 1980, it was an extraordinarily diverse, visually diverse array of images." Much has changed since Sagan's "Cosmos" first aired. In 1981, the U.S. started launching space shuttles. Thirty years later, the shuttle fleet retired. Space telescopes now peer ever-deeper into the cosmos. The Voyager 1 spacecraft, which carries a golden record of Earth sounds and images that Sagan helped compile, is now in interstellar space on its own voyage across the cosmos. And Sagan's "pale blue dot" moment when seeing the first view of Earth from deep-space has been recreated by rovers on Mars and spacecraft orbiting Saturn and Mercury. You could say it's almost a whole new cosmos to explore. The first episode of the new "Cosmos," titled "Standing Up in the Milky Way," gives viewers an introduction to the updated Spaceship of the Imagination; tells the story Giordano Bruno, an Italian philosopher burned at the stake in 1600 for publicizing his theory that planets like the Earth orbit other stars (scientists have since confirmed nearly 1,700 exoplanets, so far); and runs through a new Cosmic Calendar, which reveals humanity has only used science to explore the universe for the last second of the last day of the cosmic "year." There's a touching tribute to Sagan in the first episode of the new "Cosmos." In it, Tyson sits on a coastline with the personal calendar owned by Sagan in 1975. In it, there's a date penned in to meet with Tyson, then a 17-year-old kid from the Bronx with a dream of becoming a scientist. Tyson took a bus to Ithaca, N.Y., where Sagan — who taught at Cornell University — made time to meet with him on a snowy Saturday. "I already knew I wanted to become a scientist, but that afternoon I learned what kind of person I wanted to be," Tyson says in the show. Today, Tyson is a leading science communicator and the director of the Hayden Planetarium in New York City. Science, he adds, is a never-ending passing of the torch that keeps the journey moving. Sagan picked up that torch during his lifetime, and now Tyson is doing the same for the next generation. As Tyson says in "Cosmos" 2.0: "It's time to get going again." 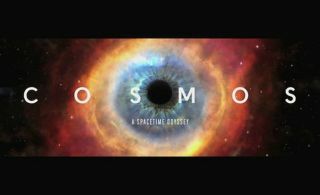 The new "Cosmos" airs Sunday (March 9) at 9 p.m. ET/PT on Fox, National Geographic Channel, FX, FXX, FXM, Fox Sports 1, Fox Sports 2, Nat Geo Wild, Nat Geo Mundo and Fox Life. On Monday (March 10) it airs again on National Geographic at 10 p.m. ET/PT. Space.com writer Tanya Lewis contributed to this report from Austin, Texas. Email Tariq Malik at tmalik@space.com or follow him @tariqjmalik and Google+. Follow us @Spacedotcom, Facebook and Google+. Original story on Space.com.